The following is a collection of anecdotes related by Anna Elizabeth May Stark, the daughter of Augustus Noah May and Sarah Elizabeth Cornett, about the life and times of her parents. It was the love story of a young couple who had known each other all their lives, and had always been "meant for each other." 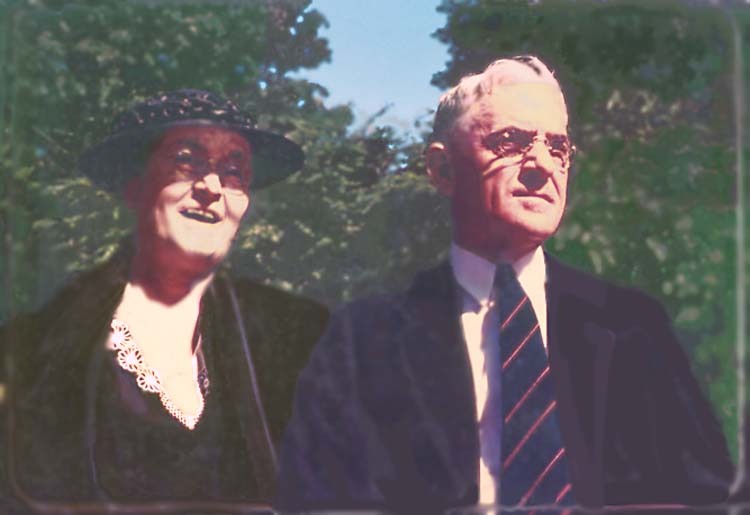 When, finally their hopes were joined in their marriage in Berea, on June 12th, 1905, the Saga of the May Family began. It must have been a lovely small wedding, with many friends gathered in the church. The wedding picture of the happy couple is our Treasure today. 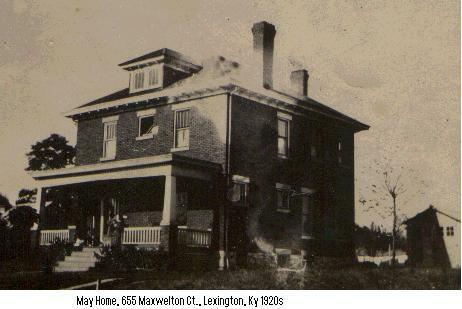 Papa was born in 1876, in August, in Magoffin County to Campbell May and Rebecca Adams May [along Long Branch Creek] He attended the Burning Springs Baptist Church. Our people went to this church... right in the center of town... But, because weather and transportation limited regular attendance, "Uncle Campbell and Aunt Becky" held regular meetings in their home, bringing down from the loft above the long benches. 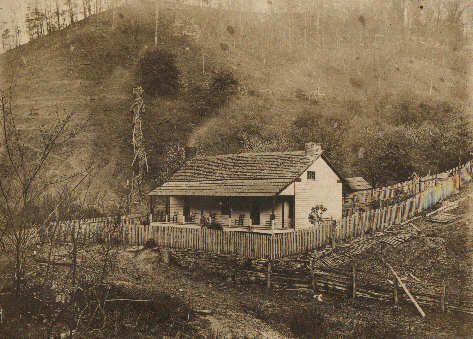 Noah May, young student in the Foundation School of Berea College, had made a name for himself and was chosen, with another young Eastern Kentucky youth, Sid Combs, to be sent to The Sloyd Training School, in Massachusetts for a year of experience. There they learned how to make the fine furnitures of the day, primarily with the oaks, the "Mission Furniture". 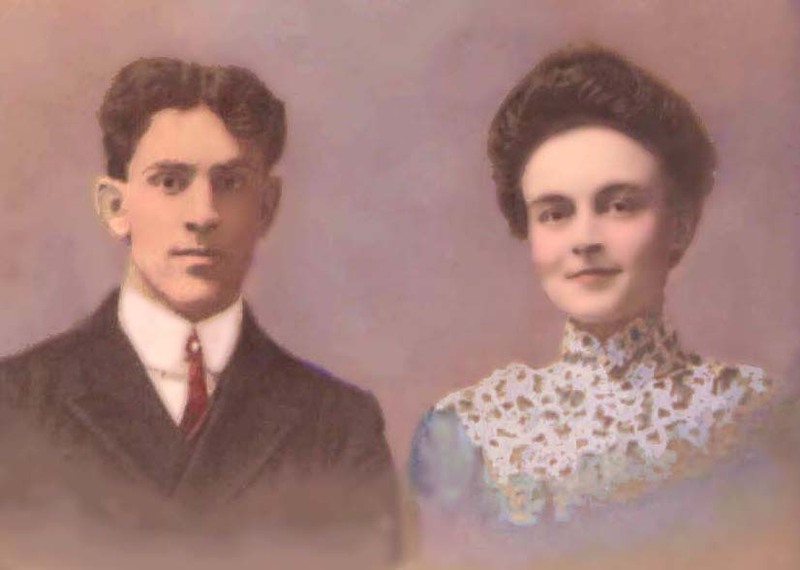 Noah came back to Berea to help develop the fine department which would become one of Berea College's best known crafts, and he could now make his dream come true...he could marry his 'sweetheart" Sarah. Being a "worker" in the college, Noah now had college housing, and Sarah and Noah began their life as 'faculty'. They lived in a dormitory across from the Tavern, in the area where the Union Church sits today. 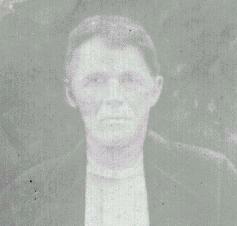 Mama's brother Ambrose E. Cornett, was a member of the Masons -- proud builders. 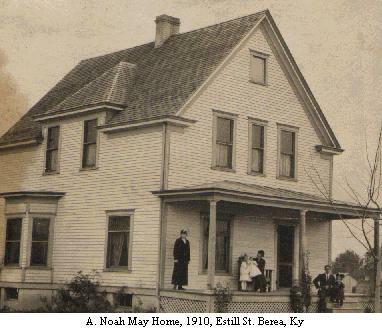 He came to Berea to live with Sarah and Noah and little Earl, their first born, while he built the home they would move into in 1910/11. Anna, their first daughter, was on her way...and would arrive while the family still lived in the school housing. Noah was asked to construct a large oaken library table (inverted V style for presenting suggested books for the students... and journals, and magazines) Along the top of the frame there were carved words to encourage learning, and perhaps ethical appreciation. That little library has been replaced by one of the finest libraries in the country. 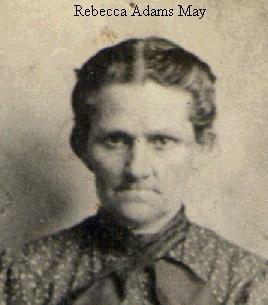 Mama was born in 1876 in Morgan County, the daughter of Russell Cornett and Ailey Amburgey Cornett. While still a girl she met Noah. She was a very strong, intelligent lady with the steady drive to make the famiy life the best possible. With the tiny salary and a three-child responsibility. She carried the ball, never fumbling, never dropping it for a second. You know that Papa and Mama were very close with Gus May, Adjutant General... Kentucky National Guard... Gus was one of Papa's pall bearers in 1944... They lived in Frankfort. We were visiting them one afternoon when we heard the sound of combined airplanes approaching. We rushed outside, right behind Gus... As we looked up into the sky the planes dipped in salute to Gus... BUT, Gus remarked instantly, "One of my boys is missing..." He soon connected with the Louisville Guard and found that there had been crash.... probably on take-off. About Chatauqua.... Our family spent two weeks there when I was about five or six years old.... Some of my best memories are of days spent in the woodlands, in the big round tabernacle, and the children's "Holy Land" One day, Baby Edith crawled away from the big white house where we were staying.... I was sent to bring her back, but I had to go into the little center of town... where we had been with our parents... I heard the sound of bowling balls down in the basement of the red brick building. I peeped in the low windows, and saw her being entertained by some of the young men. They saw me peeping, and I was soon in the basement with my baby sister, in her diapers. I imagine that Mama was mortified. Perhaps Mama had been doing the family laundry, and had not kept a good check on Edie. There must have been a genetic force at work in that little girl, Edith, because her first child, Judith, ran, scratch that, waddled away from her home on BUSY Rose Street, in Lexington, got all the way up to Maxwell Street (where her Granny Carroll lived), passed that home and kept going all the way on Maxwell until she was apprehended at Limestone Street! That must have been a half mile OR MORE from home. Where were all the good citizens of the city who saw a little plodding baby child travelling alone on a busy street? Of course Edith called for help, but it was not likely that anyone would have ever imagined Judith to have gotten so far away. I was called home a few weeks before Papa died.... and Mama, Edith, and I had special time with a faded MAN. Bill, on leave, spent nights with me in the hospital (nurse shortage in wartime).. Though Papa did not talk, and we thought him comatose, (we had his twin bed downstairs in the back living room before finally returning him to the hospital) we spoke to him as though we believed he heard us. One day, as I leaned over him he said the name, "Ruia" I asked Mama about it. "Papa had a cousin whom he dearly loved... a playmate.. But someone had betrayed her while Papa was away in Berea, and he felt like she was his own sister... the hurt. When I knew that his mind was active with memories, I decided to engage that mind. I felt that childhood memories were right then in dominance, so I just put a school question to him, something like, "What is four plus two?" As I have recalled it, he gave a wrong answer. But I was not finished. I knew that Papa had learned many poems in his youth. and as their teacher, reading them to his school children, sometimes, so I offered him a beginning line from Thanatopsis... and Papa took it up, for several lines. Later, Papa in Good Sam, Mama and I were with him, and I wanted him to know that I was going to have a baby. Though we had not heard him speak for a long time, I leaned close to his ear and whispered, "Papa, I am going to have a little boy!" Back came this amazing response, "How do you know it won't be a false one?" That scared me greatly... false one.. to lose the baby? 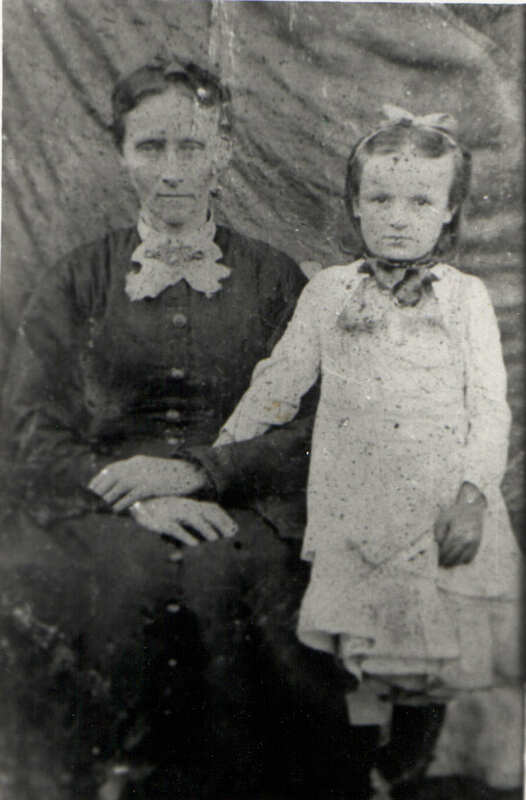 Mama said, "No, he is remembering that once, before, either you or Edith thought you might be pregnant, but were not." A poem by their dear friend Cotton Noe, Poet Laureate of Kentucky, drafted as a Eulogy. I have a copy of his "Tip Sams of Kentucky" by Cotton Noe, endorsed "to AN May, my friend and colleague." Noah and Sarah lie buried in the Lexington Cemetery next to Cotton Noe and his family. Dr. Noe, "Cotton", was a very good friend of your grandfather. They were both UK faculty. 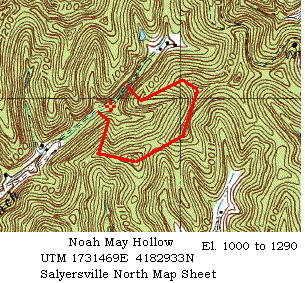 They occupied the same area of the Taylor Education Building. They exchanged their "scribblings" AND their more finished poems. To hide his real heart from every man. At what is low, indecent sentiment. Cotton Noe from "IN KENTUCKY "
stick out hrough her feet..